In order for us to fully understand and appreciate the celebrations of May Day, it becomes necessary to travel to different countries and observe both the old customs of ancient civilizations, and the modern-day reinterpretations of such customs by the various groups of today. To better grasp the overall concept of May Day; its importance and its celebrations, it is best that we look at it from the context of its inclusion in the Wheel of the Year. 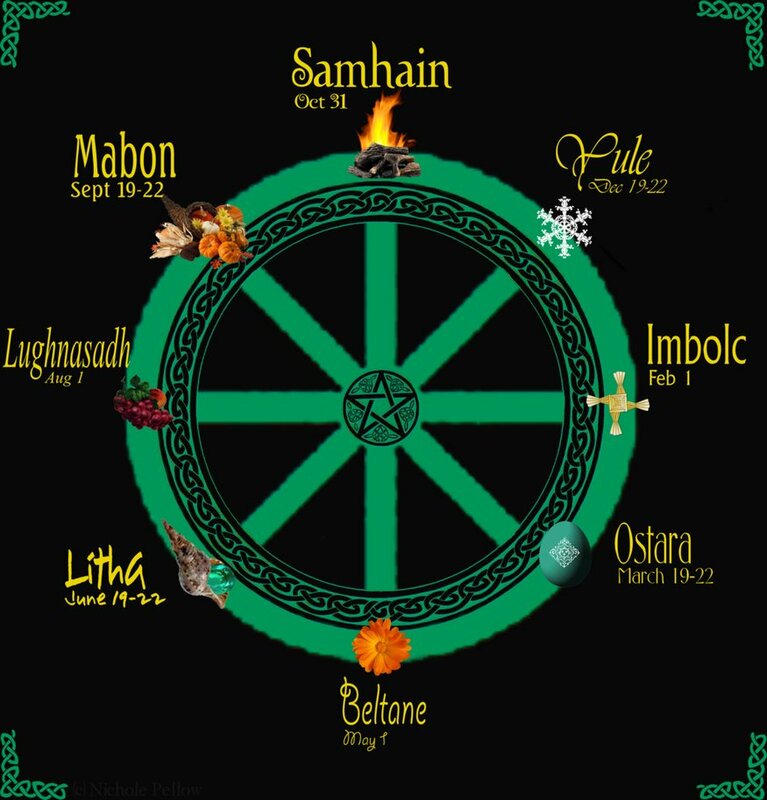 The Wheel of the Year is a modern-day invention utilized predominately by Neo-Pagans to celebrate the ongoing revolving cycle of the seasons of the Earth. It consists of eight holidays – what are known as Sabbats. Interestingly, the word Sabbat is of Hebrew origin, but the holidays themselves are of predominately Celtic or Germanic origin, having their beginnings in ancient pre-Christian festivals of these two civilizations. The eight Sabbats include the two solstices of Summer (longest day and shortest night) and Winter (shortest day and longest night); the two equinoxes of Spring and Fall (where day and night are equal); and four “cross quarter days” which occur midway between the solstices and equinoxes – Lughnasadh on August 1, Samhain on October 31, Imbolc on February 2, and Beltaine on May 1. I need to emphasize that this is a modern-day Pagan invention that started in the 1960’s and 1970’s…there is no historical documentation that any ancient or pre-Christian civilizations celebrated all eight of these festivals. However, because these were a people who lived in close harmony with the earth and with nature, different societies did observe and celebrate different natural cycles and seasonal events. 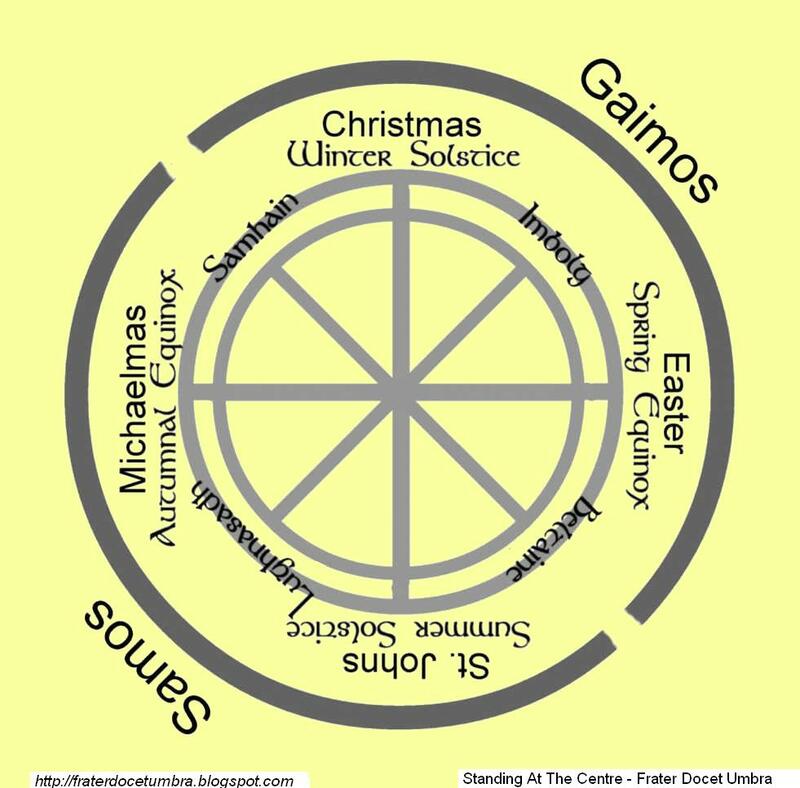 It is interesting to note that the equinoxes and the solstices tend to be named after and based more upon Germanic festivals, whereas the cross-quarter festivals were named after and originated more from the Gaelic fire festivals of the Celts. However, as we will particularly see as we examine the festivities of May Day, the modern-day Sabbats are often a diverse mix of various customs and practices melded together to create a unique celebration that takes on a personality of its own. If we take a look at the Wheel of the Year, there are two Sabbats that I want to pick out particularly for purposes of this presentation. Those are Samhain and Beltaine. These two holidays are directly opposite of each other – Samhain occurs on November 1 (although it is more traditionally celebrated the night before), and Beltaine occurs six months later on May 1. 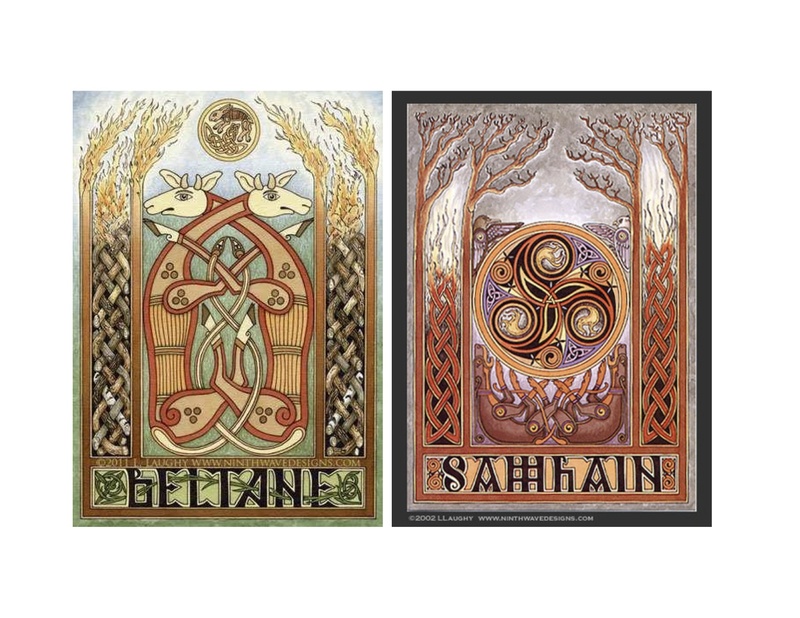 The names are both Gaelic – Samhain means “summer’s end” and thus the beginning of winter, and Beltaine means “the month of May” and thus the beginning of summer. It is interesting to note that it has been suggested that the ancient Celts only celebrated two seasons – Winter and Summer. They divided the year into two halves; a Dark Half (Gaimos) which was the time from Samhain to Beltaine, and a Light Half (Samos), which was the time from Beltaine to Samhain. So to the ancient Celts, Beltaine actually represented the first day of Summer, which is one of the things that differentiates the Celtic calendar from our modern day Gregorian calendar – we tend to think of Summer as beginning on June 21, but to a modern-day Pagan June 21 is actually Midsummer…which you might be familiar with if you’ve ever read Shakespeare…A Midsummer Night’s Dream. Midsummer is the midpoint between the two Celtic festivals of Beltaine (May 1st) and Lughnasadh (August 1st). Now let’s delve a little deeper into the meaning and celebration of Beltaine. Beltaine is the Gaelic name for the month of May, and/or the festival which celebrates it, which usually takes place on the first day of May. In Irish Gaelic, the month of May is known as Mí Bhealtaine or Bealtaine, and the festival as Lá Bealtaine (‘day of Bealtaine’ or, ‘May Day’). In Scottish Gaelic the month is known as either (An) Cèitean or a’ Mhàigh, and the festival is known as Latha Bealltainn or simply Bealltainn. Due to the former and current spellings of this word, today we find the Sabbat spelled in a variety of ways – Beltane, Beltaine, Bealtaine, Beltine, etc. It is important to recognize that when we talk about the ancient practices, and in particular the religious practices of the Celts, that in reality we know little about such practices, because the Celts put practically none of this information in writing. Much of what we do know comes from the observations of other civilizations, most notably the Greeks and Romans; as well as later religious texts and legal documents. While it is not clear exactly how or when the name was changed from Cetsoman to Beltaine, we do know that according to the Sanas Chormaic, the fire festivals of May which heralded in the beginning of summer were allegedly already an ancient practice by 900 CE, begun in pre-Christian times by the Druids. Along with this publication, Beltaine is also mentioned in the old Irish mythology of the Ulster Cycle, of which some of the older tales date back to the 7th Century and tell of events believed to have occurred shortly before the birth of Christ. This provides pretty good evidence of a fire festival held at May Day. Common belief holds that this Pagan rite was most likely the first to be usurped by Christianity when Saint Patrick lit the Paschal fires in defiance of the High King of Tara at Beltaine in 433 AD, almost five hundred years before the Sanas Chormaic. Whether or not this actually happened has yet to be proved or disproved. Like much of what we know about early Celtic history, it becomes hard to separate fact from fiction. One question which continues to be a subject of debate is just who is Bel, the “idol god” for whom these fires are named? This could be nothing more than the god Baal of the Old Testament, considered to be the Bible’s most prominent Pagan god. One theory is that Bel refers to Belenus, a Celtic sun god. 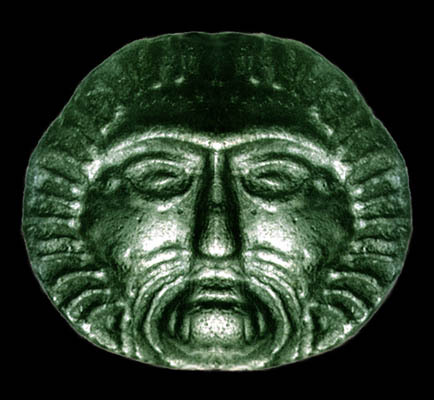 However, this theory becomes questionable when one considers the following: while Belenus did exist as a Celtic deity, he was primarily worshipped by a different Celtic tribe that lived in continental Europe, and the name Bel is not found in any early Irish literature. There is no evidence that Bel ever existed as a god of the ancient Irish pantheon. Was this a case of a continental deity and its worship making its way to Ireland during the Celtic migration to the British Isles? We don’t know…but the fact the name does not show up in the ancient mythology of Ireland, which has been passed down over thousands of years, suggests that Bel never existed on the island. Thus we have to consider references to Beltaine as being a time of honoring, celebrating, or making sacrifices to the god Bel as being unreliable. Historical documentation simply does not support such a belief. 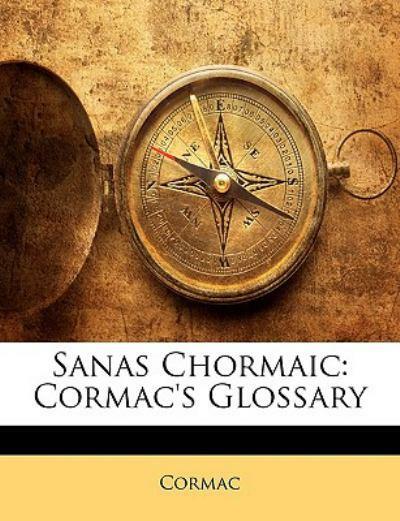 Regardless of the actual etymology of the word or its ancient beginnings, we do know that the ritual portrayed in the Sanas Chormaic survived in Ireland to the nineteenth century. 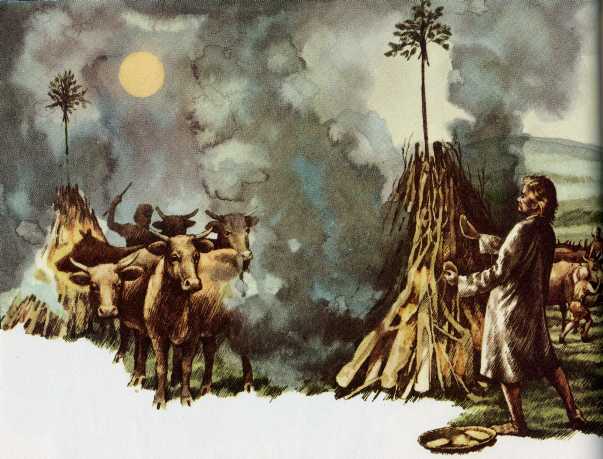 Bonfires were lit at Beltane over most of the country, and in the rural south in the 1820s, cows were made to leap over lighted straw or wood on May Eve in order to save the milk from being stolen by the fairies. In 1838 the farmer Humphrey O’Sullivan casually noted in his diary how he had driven his cattle between two fires on that night exactly as ‘Cormac’ had recorded in his glossary almost a thousand years before. Cows were not the only things leaping over Beltaine bonfires… humans also leapt over the flames for blessing and protection. If a man was about to perform a long journey, he leaped backwards and forwards three times through the flames to give him success in his undertaking; if about to wed he did it to purify himself for the marriage state. If going to undertake some hazardous enterprise, a man passed through the fire to render himself invulnerable. Women also participated in this rite – once the flames had died down to glowing embers, women would step over them in order to procure good husbands; a pregnant woman would do the same to assure a happy, healthy delivery. Children would be carried over the coals to bless and protect them. Each household would carry some of the glowing coals back home to kindle a new fire in the hearth, and remaining cold embers would be scattered in the fields to bless and protect the crops. Interestingly, it was considered very dangerous for others to be allowed to take fire from one’s home on May Eve or May Day, because they would thereby gain power over the inhabitants. In sixteenth-century Ireland a woman who tried to borrow hot coals from neighbors during this time was thought to be a witch. Indeed, many of the old customs and traditions of this day were a form of protection against witchcraft: in many parts of the country the belief was that during the first part of May the witches were abroad in all their force, casting ill on cattle and stealing cows’ milk; thus to counteract their evil power, fires were kindled by both farms and villages. The irony to be found here lies in the fact that today such bonfires are often lit as a part of the festivities to celebrate one of the most significant Sabbats in the Wheel of the Year – which is an important component in many paths of Neo-Paganism, which includes the practice of modern-day witchcraft. By the end of the nineteenth century, the Beltaine bonfires had pretty much died out all over Ireland, and indeed all over the British Isles. A few relics of the fire festivals survived into the twentieth century and may still be found in some areas today: the first being the belief that one should not share fire from one’s home on May Day; and the other being the making and eating of the bannock, a small oat bread or cake that was originally baked in the sacred flames. Thank you for the kind words! I enjoyed writing up this piece, which actually was a presentation that I gave at our local library last night. Unfortunately we did not have the large audience I had hoped for, but I do think those who did attend enjoyed it and learned something. Hopefully others will gain some knowledge from reading it here. Do try to find the time to read parts two and three…I think you will find the whole series to be enlightening! Hello, an interesting and well-documented article. Just a thought about Beltaine’s etymology, has anyone considered the prefix bel- as meaning mouth? Extended meanings include rim, edge, opening, it is often found in bynames and toponymy. It might make sense as the cattle had to pass between two fires and thus cross some sort of symbolic opening. Bel also represented the source of speech and was metaphorically used to describe kingship. I guess we will never know for sure, but these seem more likely an explanation than Belenus.